apologies for the silence over the past few months. 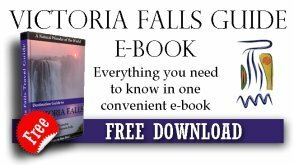 Time has got away from us, but pertinent is that there is little to report during the wet months of the year. As we have reached the end of the rainy season it is time to take stock and see how we are placed to tackle the dry season ahead. 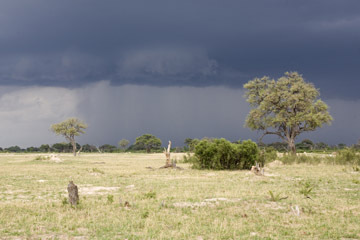 The rains this year in Hwange have generally been very patchy and sparse, although recently have been more widespread and plentiful. Most pans are holding some water, but are by no means full, an ominous sign this time of the year. Despite this, the bush is looking magnificent. Teak trees are adorned with pretty pink flowers and as the grass slowly turns from green to gold, myriads of fluffy seed heads bob and sway in the breeze. The Acacia Erioloba are showing a bountiful harvest of fat ear shaped pods, and many pans boast clumps of gorgeous mauve water lilies. An isolated thunder storm in the pre-dawn flashes streaks of lightning, and a watery sun struggles over the eastern horizon, sending shafts of sunlight to pierce the bruised sky. Giraffe, ever curious, glide serenely through the grass, a Zebra stallion, resplendent in black and white, holds his head erect and regal, nostrils flaring. A pair of Egyptian Geese stand motionless, reflections mirrored in a pan. A male Steenbok with tiny spikes for horns, poses close to the road, huge ears pivoting, nose wet and black, twitching, coat a glossy sheen in the sunlight, dainty hooves that would doubtless fit into a thimble ready to dart into the brush. March is butterfly season, they flit in their thousands alighting on grass and elephant dung, no doubt for moisture and to deposit eggs. A Martial Eagle hangs suspended high above, soaring, effortless. Yellow crowned Bishop birds dart through the reeds like fluffy over-sized bumble bees, hovering, displaying to their mates. Such are some of the sights and sounds in the Park at this time of year. Gary has been busy repairing and servicing Lister engines and has made a start to scooping out excess soil from some of the pans to back fill troughs eroded by elephants. Thanks to our new tractor bought with generous donations from the Zimbabwe Wildlife Fund in Perth and a donor who attended our dinner/dance held in September, and the loan of a dam scoop, we can start to tackle this immense task, as well as to make rudimentary repairs to some roads while traveling to various pans. The solar pump at Kennedy 2 Pan will this year be aided by water from a new borehole drilled by WEZ Matabeleland. Although the solar pump produces good water, it is sadly not enough to cope with the hundreds of elephant that drink there at the height of the dry season. Windmills are being serviced and where necessary pipes repaired and re-laid. Due to the early appearance of breeding elephant herds, Wilderness Safaris have already started to pump some of the pans on their concession. Becs Ndlovu and Nic Polanakis of Somalisa have drilled several new boreholes which will help to alleviate pressure on existing pans in the area around Kennedy 2 Pan. Martin Pieters has built a magnificent new camp, Nehimba Safari Lodge, on a new concession near the Nehimba Seeps, north-west of Main Camp, and has plans to pump several pans in that area. Dave Carsons has built a new camp at Big Shumba, and as well as establishing permanent waterholes there, has re-thatched the structures at Shumba picnic site. He and his staff assist National Parks wherever they can as regards maintenance of the picnic site. We are grateful for all endeavours to help with water resources in the Park. It has become apparent that FOH needs to establish a base near Main Camp. 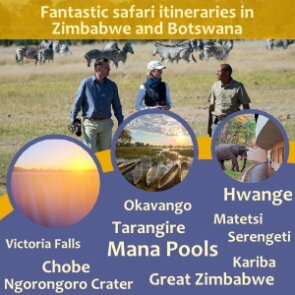 In this regard, we have joined forces with Hwange Lion Research, obtained a lease for a piece of land near Dete, and funds permitting, plan to build an office and several small lodges to house staff. More details of this will be made known as we progress down this path. 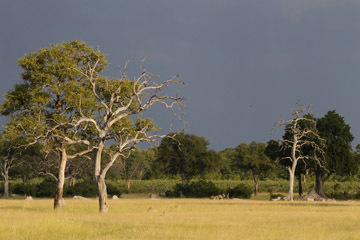 As usual, we extend thanks to the many people who support our efforts to sustain Hwange National Park and it's Wildlife. We are constantly uplifted and humbled by acts of astounding generousity, and remain dedicated to preserving our wonderful heritage.